Help! I was badly hurt in an accident at work. What type of evidence do I need to document a work injury in Houston? Getting injured on the job is very scary. You’re smart to be thinking about what kind of records you need in order to document your work injury. With the right evidence, you can get the compensation you need to cover your medical expenses, lost wages, and more. Filing any type of injury claim requires a lot of work and a lot of evidence. 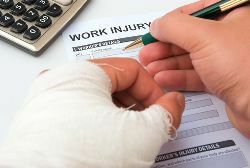 You must prove a number of things in order for your employer to cover all of your costs, such as how the injury happened, and that the injury happened as a result of an accident at work. This is not always easy. If your employer has workers’ compensation insurance, you must battle his insurance company to get the entire settlement value that you’re entitled to. If your employer does not have workers’ compensation insurance, you may be put in a position where you have to battle your employer for the money needed to cover your medical bills and lost wages. Throughout all of this, you are watching your medical bills pile up and your checking account dwindle without a paycheck. No matter how your case is handled, here are some of the most important types of documents for you to hold on to so that you get the compensation you deserve. Medical bills. It’s not cheap to have a serious injury treated, even if you have good health insurance. Keep track of all medical bills so that you can be reimbursed for your expenses. Time missed from work. You are entitled to receive a portion of your lost wages. Keep a journal of how many days you were forced to miss work because of your injury, and a doctor’s note to support your claim. Take pictures. Pictures can paint a picture of what happened. Take pictures of as much as possible that had to do with your accident, such as the place where it happened, the injuries themselves, and anything else that may tell a story of what caused your injury. Witness statements. Did any of your coworkers see the accident? Document their statements of what happened for the record, while it’s fresh in their mind. A journal. A serious injury will shake up your life. Keeping track of all of the critical details may be very difficult, if not impossible. By writing in a journal every day about your health, your symptoms, your activities (or lack thereof) and more, you will have a clear record of how your injury shook your life. Did a work injury in Houston (Link to Worksite Injuries PRACTICE AREA page) change your life? Let us know about what pieces of evidence you held on to that helped your claim in the comments below.